Using a registry cleaner can help to keep your computer running smoothly. 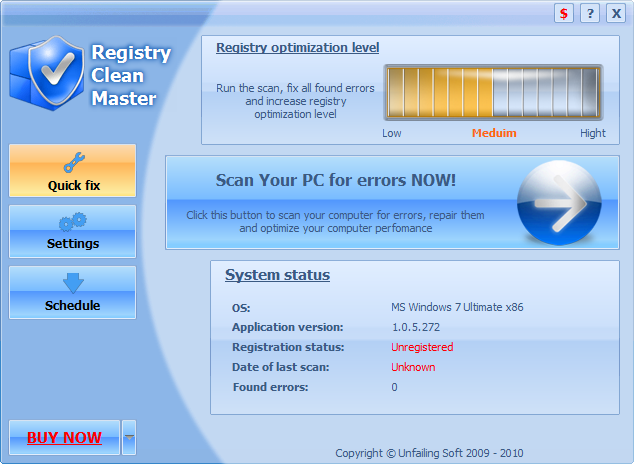 One such solution for defragmenting and optimizing your registry is Registry Clean Master. This solution is user-friendly and intuitive, requiring no special knowledge on your part. It has modest system requirements and supports all modern versions of Windows. Registry Clean Master also includes a task scheduler and the ability to carry out customized scanning. ...... As a result, applications may "freeze" from time to time, especially during their launch. Is there an easy way to do away with all those slowdowns, hangups, and sometimes even data loss (when you cannot save the document that you are currently working on)? What can novice users (who don't have much time to read piles of books on Windows' innards) do to solve the problem and to make their computers as agile as new? It doesn't matter if you are a newbie or an advanced user - Registry Clean Master offer you a simple yet very efficient solution, our Registry Clean Master. Now a clean Registry is only a few clicks away! * Suitable even for novice users - no deep knowledge of the operating system is required! Qweas is providing links to Registry Clean Master 1.0.6.291 as a courtesy, and makes no representations regarding Registry Clean Master or any other applications or any information related thereto. Any questions, complaints or claims regarding this application Registry Clean Master 1.0.6.291 must be directed to the appropriate software vendor. You may click the publisher link of Registry Clean Master on the top of this page to get more details about the vendor.